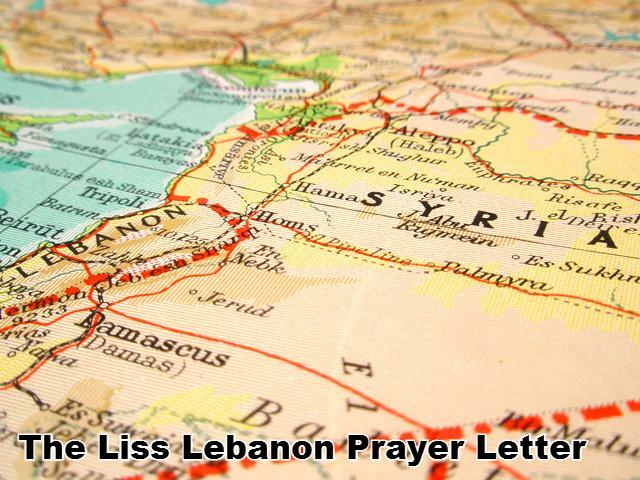 Lisses To Lebanon | Life in Lebanon for this missionary family. As I am sitting in the back office writing this, Louis is sitting in our salon with one of our staff members and disciples named Rezan singing Arabic worship songs. It is beautiful! Rezan is about to turn 20, so I have been reflecting on our last five years of ministry here. Can you believe we met Rezan when he was only 14 and now he is one of our most important staff members. Since our last update in February we have been praying in gratefulness for the continued rains through the end of the winter. The rain means less days without water in the coming summer. As Spring begins the rains have not ceased, so our prayers of thanks are also prayers for patience and perseverance as we itch to go outside. One of our Arizona supporters came for a visit this past month and it was delightful. The staff loved the visit and getting to meet people from our lives. He was able to participate in and visit all of the ministries we have in Lebanon and see in person the people whose stories we share with all of you. It was a real blessing for us. The team has been growing in a good way this season. As routines have been formed for our newer staff, the relationships are able to grow stronger and deeper. The national staff has taken ownership of the internationals, and the atmosphere has grown more and more to be Christ’s culture of loving all people. God is definitely leading as people have heard from God to pursue different projects to find soon thereafter other people national and international desiring the same goals. As these goals become firmer, the paths toward them becomes clearer and the team dynamics have been amazing to work with. Finally, our member care sessions have continued to grow. We have had an increasing number of sessions with nationals to work on relationships, ministry, obedience to God, depression, anger, addiction, and many other topics. This has been a beautiful time of seeing God work in the simple concept of using Biblical language and returning to God’s word all the time. In the beginning of one session with a young woman we thought was Muslim, Louis asked if she was a Christian believer and she said she was and instantly told us her testimony. It was a great reminder that sometimes people just need to be asked. We don’t know everything about someone unless we ask questions. The Beqaa Team continues to grow with two Americans and two Lebanese now living in the Beqaa and the family of 5 getting ready to move out there in 6 months. The ministries are getting more and more stable and engaging with people really well. There is going to be a Cubs to Lions (the Horizons discipleship conference for Christians from a Muslim background) in France this summer! The Global Summit is coming up this June. We are so excited to see the global staff of Horizons again. As winter ends, we have all had various levels of cold and flu symptoms, as have all of our team members, so lift our health up in your prayers. Our dates are still in flux, but if you are in North Carolina, New York, Michigan, Utah, Colorado or Arizona and want to see us please send us an email and we can coordinate. As our dates get more set we will post some appointment slots online too. December and January were excellent months and hard months simultaneously. We officially started our Language Academy of Beirut, and Louis and I have both been working with the new staff and interns as well as the staff and interns already here to boost their language acquisition skills and I have been working to coordinate classes to learn Arabic. Christmas was a beautiful time this year of rest for our family. We took a week in France to celebrate David’s new joy and passion for French, which he began learning this year in school. We spent Christmas in Avignon, which was like a storybook come to life with the castle and tower walls. After our week as a family, Louis and the kids flew back to Lebanon and I remained in France for three more weeks to take an intensive French course myself. As many of you know, God told me to attend Rutgers, and I am currently working on an online Masters of Library and Information Science. Through the Rutgers study abroad program I was able to go to France and take this course. Several of you stepped up in December to help cover all of the costs, which was amazing and I thank you for making it possible. In addition to being able to jump start French for myself in order to stay ahead of David as he needs homework help, I was also able to really investigate how I learn language myself. Because Arabic is the first language I have made a real effort to learn, I have tried a lot of different things, but hadn’t found the way to success. With French I was able to share a testimony of Jesus’ healing in just a week and a half! I was able to start using French, writing in French, and I am also reading a French chapter book. Now that I am back in Lebanon with my family we took one week together before I began with new Arabic teachers. I am using what I learned in France to jump forward in Arabic as well. The kids and Louis did so well without me, but it was hard. Lebanon had several days of flooding, so the kids were out of school longer than usual for winter break. This also shut down work at the center and left a team stuck in the guest house for a few days of their week long trip. We were seriously reminded that God is in control. Our newest staff members have all found apartments now, and many transitions have happened to make life possible for them. We have a team moved out to the Beqaa Valley now, a family with three kids living near our center, and our two newest staff (who we had as interns in prior years) will be moving into their apartment between ours and the center on Saturday. One final bit of encouraging news is in the realm of relationship building. We have shared in prior posts that it can be challenging to make friends here because of the tribal nature of the people. To spend time with us would limit time with family, for instance. We have had multiple fruits of our commitment to relationships, and the most recent joyous occasion was being able to attend the engagement party of two of our friends. Not only the invitation, but also looking around the room and seeing that we knew almost everyone there and all those people were happy to see us was a huge blessing to us. We have a lot of good news to share, and we don’t mean to say everything is always good, although God Is Good All The Time! We have had family health issues, team conflict, and minor crisis. You can be praying for those things, but also we want you to be encouraged that we are obeying God and seeing the fruit of that obedience. We love you all and your support is how we carry on. We know your prayers and love surround us. This fall season has been marked with getting back into routines and so many ministries we have been working on over the past five years taking form. The Language Academy of Beirut is something that Annie had been asked to participate in a few years ago, but the logistics did not lend themselves to a realistic plan at the time. It was a dream to have people on staff or internships with Horizons whether in Lebanon or outside of the country, and also for others outside of Horizons to be able to learn Arabic with language helpers here in Lebanon. This would have the benefit of providing jobs to people here, and also allowing us to expand our preparation for incoming staff and interns so that they are not landing in Beirut with no Arabic. Although two years ago was not the right time, doors have been opening and things have been falling into place for Annie to participate now. She wrote a curriculum packet and also has been evaluating the different current staff and interns’ levels to learn how best to place people. Rezan is the first teacher, and so he will soon be leaving our department to work for the Middle East Center for World Mission Language Acquisition Department. Rezan now has something like 13 Arabic classes every week, a full-time schedule of teaching. The next step is to start bringing in other teachers as well to take over our internship classes so that Rezan can focus on his students that are more permanent. The MEC is a whole world of opportunities for our future as well, and as we continue to replace ourselves, we are folding our ministry into the MEC over time, and Louis hopes to be in a position to take a leadership role in the MEC to train nationals and internationals alike in cross cultural missions. We are dreaming of taking a team of Lebanese to another country on mission trips and transforming our trainings into useful material for Arabs, Asians, Americans, Europeans, and all others who come to the MEC. The MEC has many goals which will fulfill many of our deepest desires, and it is far too soon to even express everything we hope this can be, but we will share more as it becomes even more of a reality. This month we broke ground on our first MEC building purchase, which will serve as a prayer room directly behind our Horizons Café. This new purchase is a big step in moving from a dream to a reality for this center. The ministry in the Beqaa, which has the largest group of refugees in tents, has also been expanding tremendously. A year ago there were one or two trips out to the Beqaa each week, and now there is a full team going four or five times a week. The team is made up mostly of people on our staff already working in admin or with other ministries who God has called to the Beqaa. Additionally, we have several new staff living in or moving to the Beqaa. Miriam is a Christian who already lives in the Beqaa who just joined Horizons staff, and Annie Ostrander who was our first intern ever, and has been on staff with us for several years now, will be moving out there soon. Additionally, our newest staff member to join us is a nurse who has on her heart to move out there. Finally, our family of five that just moved here will be moving out there in about six months. The staff influx has been tremendous. The stories of how people have found us can only be God! This new family, for instance, the husband, Tommy, was just walking through Beirut and ran into Louis and started talking to him. The nurse, Robbie, is working with another organization and we have been able to form a partnership between our two organizations. It has been an amazing time. Louis and Annie have both been very involved and redefining roles in this new season because onboarding several families and people at a time is much more time commitment than one at a time. Currently there are three more applications at various points in the process, and with both of us looking toward new ministries it has been a challenge. Annie has taken the lead on the language component of onboarding because of her involvement with the LAB, and Louis with member care and pastoral care because that is his gift. Both of us meet with the new staff once a week for the first month to go through our own onboarding materials and to make sure that everything goes smoothly. This past week, Annie has been taking the Henderson family shopping for electronics for their new apartment. Annie also has on her heart to make sure that we are including the Henderson kids in this process, so she spent an afternoon with the older girls and processed through some of the culture with them and encouraged them. Of everything we have shared, that lifted Annie’s heart the most. Additionally, our own kids are being involved more. It seemed with David being at school two hours longer each day this year and having our day broken up by the two different bus pick up times, we would be limited, and it has in some ways, but it hasn’t completely closed us off. David has become much more proactive at school and has really found his footing, so he got the number of a classmate so that we could go over to her house. It was a wonderful playdate, the first time we have hung out with another family that was a school friend only. The visit was amazing, and we will be bringing them to our church’s cookie decorating and puppet show evening in December. Kyrie has missed going to the café with us, and so we have been working in afternoons that we can all go to the café to practice Arabic and have the kids around for meetings. This has pushed David outside of his comfort zone and allowed her to use Arabic since this year her class is English only. Kyrie is also thrilled that the new family has three girls, and she has been having a lot of fun playing with them. It has helped the girls feel included and befriended after leaving their own friends in America. We are all going down to Tyre for the first time since we got back to Lebanon this week! Annie has a huge heart for Tyre and since all these doors have been opening in these other ministries, hopefully God will start to show what he is going to do with Tyre, but it seems like it is going to be a family adventure! We can’t wait to share what God shows us. This week we will be going with a staff couple, Caleb and McKenna, and Caleb’s parents who came out for Thanksgiving. It will be a good member care time and also, we always love going to Tyre. This is such a small portion of everything that is going on! Thank you for all your care and love and prayers. If you would like to send us a bit of Christmas, putting it into our account now means we will see it at Christmas time. We have a visitor coming from Tucson this year, which we are very excited about! As we get closer to that time we will let you know if he will have room to bring cards over with him or the like. We are so blessed to see God using us here in Lebanon, and we want you to know that nothing here would be possible without you. Having a new family here and seeing how their first week has gone so well has brought many tears to Annie’s eyes as we remember the horror that we went through our second day here and into the following months (Month 1, Month 2, and our huge Change of Plans in Month 5) . Our motto has been “We don’t want anyone else to go through what we went through.” And the first week of this Henderson family being here has been the fruit of that. Your prayers have sustained us these past five years, and 6000 more words won’t be enough to express our sincere appreciation. And then there was this chicken that wandered into our building this week! Oh, Lebanon! SIGN UP to receive our in depth Prayer Needs as part of our Prayer Warrior Team. Still want to sign up for the prayer warrior team so you can learn more about this need in our lives? The Week of Prayer Begins! Throughout the week those of you signed up for our prayer team will receive in depth prayer requests for this next season of our ministry in Lebanon. If you haven’t signed up yet, what are you waiting for? The first prayer letter goes out at 7:00AM Arizona Time! If just a quick prayer and topic is best for you, each day on our blog the prayer for that day will be posted. The prayer team will receive in depth, personal, and private prayer requests not meant to be shared on social media. Thanks for praying! Join us for a Week Of Prayer! Over the past 5 years we have set aside one week each season to stop. Fast, Pray, and Seek God’s Direction. It is so easy to get caught up in the never-ending onslaught of each day until one day we look back and wonder whether we are actually pursuing God’s direction for our lives. Every season for the past two years we have taken a week of prayer, and we want to invite you to be a part of this week with us from October 28 – November 3. We will be fasting according to the specific recommendations of the fast, but you are welcome to join us by following the theme of the fast which is to separate ourselves from the choice foods in our lives. Annie has decided to fast from coffee, which made me want to reconsider the whole idea (just kidding). The prayer challenge will work the same as in past years, which means that the prayer for the day and main theme will be posted on the blog and facebook, but the in depth prayer needs will only be sent via email to our Prayer Warriors. This is a team of people who have a desire to pray more intimately for us. These emails may include information that cannot be posted publicly, so we ask that you commit to keeping them within your prayer groups. Thank you for your unbelievable love and support. We couldn’t be here without you. We just finished a 2 month tour of the states where we spoke at 7 churches in 8 weeks! We want to thank the unbelievable support from the incredible servant hearts of our supporters. It brings us to tears when we think of the countless hours of prayers, e-mails, and events that you have committed to us through the years. Because of you the hungry are being fed, the lost are being found, and the gospel is being preached throughout the world. Thank you. Kyrie Rebekah Liss was baptized on August 18, 2018. The following Sunday when Pastor Dan Valisakos asked her what happened to her. She boldly replied, “My daddy got my dress all wet!” Now every time we read about baptism in our family Bible times she stops the reading to remind us that she got baptized, too! I remember when we left for a visa trip two years ago and Annie “accidentally” chose a hotel without WiFi. When we returned to Lebanon my phone exploded with over 1,000 missed messages. That was when we began realizing I was doing too much and needed help from the national staff. We hired three people to help with my work load and spent a year helping them transition into their new positions. After returning this summer it was unbelievable to feel missed but no longer the only one holding things together. The staff is thriving and growing in experience every day. Because of all your support, David and Rebekah were able to start school this week. The only struggle was convincing Rebekah that she would have to return home each day. Predictably, she has already made lifelong friends so she doesn’t have to worry about bridesmaids at this point. David showed marked improvement in Arabic last year after one of our high schoolers began coming over each week to tutor him. David will be starting French this year and Annie is going to take an online class in French so we can better help Davey with his trilingual education. Doors have been swinging open with our new ministry center out in the Beqaa Valley where over 500,000 refugees live in camps working as farm laborers. At the beginning of the summer one of our staff, named Yusef, was put in charge of running the daily services and distribution at the center but was still commuting three hours each way every day. I was praying for long term staff to move to the area so Jesus can be shown in more incarnational ways. Over the last six months we have had two families and two single women volunteer to be part of our ministry expansion team to the Beqaa. Stay tuned for news about the exciting growth of our outreach facility. Family: Pray for the kids returning to school, that they would be able to share Jesus with their peers and teachers. Ministry: Pray for grace filled sound doctrine as we are beginning our year of curriculum development this year. Future: Pray for the team in the Beqaa Valley to have a singular vision and direction for the long term growth of the gospel. School: Annie has decided to take a month in France to do a French language intensive. Pray for this month of separation for the family. You are Invited to Kyrie Rebekah’s Baptism!